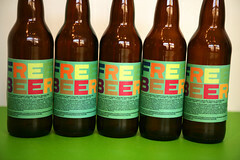 FREE BEER 3.3 Ready to Drink! They say that the best things in life are free, and yet people regularly pay £200-£400 for a one day course on a variety of topics. Heck, I’ve been lucky enough to charge for running CPD sessions myself, so I’m not writing here to complain! This last Friday, though, the decision in school was that for our staff development PD day, where previously we have had outside speakers come in and run session on whole-school issues, we would take advantage on some of the that already exists within school. Part of it is that there are pockets of expertise in one particular area and part of it is that some teachers are (naturally) better at some things than others. Heads of department signed their staff up to 3 sessions a week before the day and the idea was to spread staff around the sessions so we can all feed back in the next departmental twilight (this week). I signed myself up for ‘Planning for Outstanding’ delivered by a local assistant head, ‘Starters and plenaries’ jointly run by an HE and a science specialist, and ‘Building Challenge to Support Pupil Progress’ by one of our assistant heads. Feel free to skip a section or two if you like, but as you might have guessed by the title, the day was really, really useful and productive. It did that thing that happens at Teachmeets, the CAS Conference and other events that I would class as the very best I’ve been to – left me enthused and convinced that I have the tools to be a better classroom practicioner. I ‘decided’ before the day that it was going to be a good one and that I wasn’t going to be cynical about being told how to teach by my fellow teachers. While I mean that, it also tells you something because I initially had to decide not to be cynical. I can safely say that no conscious descision was involved in deciding that it was a genuinely powerful and incredibly worthwhile day. Right then, gushing over, here is a breakdown of the 3 sessions (which I summarise largely for my own reflection, but also with the hope that others can steal the same ideas for themselves). In this session we looked at how we can use our in-house lesson plan to plan effectively for learning and progress. This sounds a bit dry, and it’s hard for it not to be, but after the talk about Ofsted and standards and what Ofsted expect to see and how we can make sure we plan for it, the best thing to come out of the session was a really interesting version of a lesson plan that the kids get to see. The idea is that you produce an A4 or A3 document that looks like a lesson plan but that lasts for a whole topic of work. You have aims and objectives, key words and a place for pupil and teacher comments at key stages (say three times over the course of the unit). This allows an opportunity for providng (and, perhaps mildly cynically) evidencing AfL and students’ responses to AfL. I say mildly cynically as it saddens me that we have to produce evidence for Ofsted. That said, I think that overall it leads to a positive result as this kind of back and forth can only, really, be useful for the students. The really intriguing section, though, is the bottom half of the page. Here you have a 3 x 10 grid (assuming a 10 week topic, adjust as necessary). For each lesson there is a satisfactory, good and outstanding description of the lesson outcome (e.g. I can create a 3D drawing of a house, I can create a 3D drawing of a house and use textures to make it look realistic, I can create a 3D drawing of a house with a range of extra features such as a garden, fence, hedge and swimming pool). You could rename these as All, Most, Some; you could use grades A-B, C-D, E-F; you could use levels 4c/4b, 4a/5c, 5b/5a. Each student gets one to stick in their books (I know, I know, ICT, I’ll come to that) and this is their primary document throughout the project. Now it’ll take some time to prepare and you need to allow some freedom for course correction along the way, but it’s basically a whole SoW mapped out from the pupils’ perspective. I’m very, very seriously considering giving it a go. Stand Up Sit Down – Students have 4 cards pinned together on a keyring, lettered A B C and D. Stick 15 questions on a slideshow and everyone has to show a letter. Get it wrong and you’re out (but still have to play). Be still standing at the end and get a merit, sticker, sweet or some other reward. What’s The Image? – Print a picture, get it laminated, cut it into odd shaped pieces and instant jigsaw. Starter is to assemble the picture and deduce the topic of the lesson or kick off a discussion. Loop Cards – A bit like dominoes with a question on the right and an answer on the left. The cards go round in a circle so read your question, whoever has the answer asks the next. Time two teams or pit whole classes against each other in a time trial. 10 Questions – One volunteer (or victim) has to answer 10 questions asked by the teacher. The class don’t comment but give a tick if they think the answer is right and write their own answer if they think it’s wrong. Discuss the answers but it takes some of the pressure off the need to be right all the time. Mystery Bag – get a cloth bag or even a box. Put objects inside that relate to a topic and students have to feel their way around and either guess the linking theme or suggest 5 more items that could be added. Guess The Logo – Pretty simple idea, get osme logos related to the topic and remove enough detail to make them less obvious. Question Answer Question – Write out a list of 10 questions. The students have to first answer the question, then write a new question that leads to that answer (which you can’t do if you don’t understand the topic). Artist’s Easel – Provide a paragraph of prose explaining a method or process (e.g. how an email gets form one computer to another). Students draw a diagram to represent the process, highlight (say) 9 key words and finally perform a diamond rank or similar. Memory Board – Put 10 or so words on the board. Give students 20 seconds to remember them then hide them. Students have to explain all of the key words on paper or whiteboards. Weakest Link – Odd one out game, stick 4 pictures on a slide and get students to identify and justify the odd one out. Especially good if you make the answer ambiguous. You Say We Pay – Slideshow of images related to a topic with obvious names written underneath. One (or two if you want some competition) pupils sit with their back to the screen and have to guess the object. Those giving clues aren’t allowed to use any of the words on the board. What’s In My Head? – At the end of a lesson have a picture of a head with some key words behind it (unseen). Pupils list the keywords they think you will have included and then you can reveal the answers or get students to elaborate on their suggestions. What’s The Question? – Based on jeopardy, have a series of answers on the whiteboard and students have to work out the questions. Guess Who – Just like the Churchill advert (Am I…. Genghis Khan?). Laminate some A3 paper, cut into strips and apply velcro to make a headband. Laminate some people, objects or ideas and away you go. True/False – Write some HARD true/false questions. Two teams have a go at guessing the answers – teams because this encourages debate and discussion about WHY the answer is true or false. They’re tough questions so there’s no shame in getting it wrong and even if guessing you have a 50/50 chance. Scrambled Letters (this was my favourite) – laminate 3 copies of the alphabet per group (groups of 3 work well). Each person should have one copy of every letter. Set a question and the winners are the first group to spell out the whole answer. Teachers (at leasT) get HUGELY competetive. And it hits the literacy agenda too. Dominoes – Produce domino cards with words relating to the topic in hand. Students have to play the cards however they want as long as they can justify the links in the context of the topic. Diamond Rank – Produce 9 cards or key words. Students (preferably in groups) organise these into 1 most important, 2 very important, 3 important, 2 less important and 1 least important. Missing Object – Create a slide with 15 or 20 objects. Then a blank slide, then the same slide with 1 object missing. It’s surprisingly difficult to spot the missing object. This was another great session, with a good mix of theory and practical ideas. Initially expecting it to be about G&T students I actually found myself being given a whole range of strategies that fit in well with my minimally invasive strategy. They’re mutually exclusive in the sense that I have to be invasive enough to set specific tasks, but the principle of encouraging students to think and learn for themselves is on the same wavelength. The workshop leader even started with the same sat-nav metaphor I used with my Y8s last week. The theory stuff included why we need challenge (e.g. top football teams raising their game against their closest rivals) and what happens if we don’t have it (no sense of achievement, slow progress). We looked at the fixed vs growth mindsets and examined questioning strategies (which I have always found to be a weakness of mine). The Pit is an idea whereby if you draw a graph of clarity vs time you start just positive (concept), dip way down (conflict), start to turn a corner (construct) and shoot out higher than ever (consider). The idea is that by tackling tricky concepts without being spoon fed you get confused, but then work your way back up and ultimately understand the topic far better. All of the practical tasks below are designed to support this pattern. The practical stuff that supported this could largely fit into the previous session as well, although some tasks were too long to be thought of as plenaries and starters. not all, though, by a long shot. Tarsia – Google it and you’ll find a website that lets you input key words and spits out triangles that fit together by linking two things together. Like a domino but with more complexity and more thinking involved. Concept Mapping – Something that many of probably come across, but I hadn’t. List key words randomly around a piece of sugar paper then draw lines to connect some of them. On the lines write (in prose) about the links and explain them. After a few minutes, swap with another group and you can’t make any new connections, but have to expand on the previous ones. Perhaps repeat once more and then go back to see what has happened to your original map. Which Wordle Words? – Use Wordle or Tagxedo to create a uniform word cloud and have students select just 5 of the most important. Then make them rank them or use them in a sentence. Tagxedo has the added benefit that you can mouse over the words and they will pop out on the screen so you can highlight them interactively. Thinking Tube Line – Grab a screenshot of a train line (preferably with a branch somewhere) and remove the station names. Have one concept at one end (e.g. freedom) and one at the other (Internet). Students then have to fill in the station getting from one to the other. It may end up as a journey or a continuum, or something else. Surprisingly tricky to do and if you do get a high flier finished early then add a thir word at the end of the branch (safety) and get them to think a bit deeper. Folded Opinion Line – A twist on a classic. Have ‘agree’ and ‘disagree’ on the back wall and students stand according to their opinion. Get the left-hand half to step forward, turn around and shuffle to the far end – the most extreme on the right is facing the most central, and the other most central is facing the furthest on the left. Each side must talk for 30 seconds without pause or interuption about why they chose to stand where they did and at the end they decide on a (potentially) new place to stand. Challenge Cards – Rather than rewarding quick finishers with more work at the same level, give them a card with a question. A really tough question. Maybe give KS3 students a GCSE question, or GCSE students an A Level question. How does the Internet work? When is it OK to ignore copyright? What is the definition of a computer? 6×6 – Produce a 6×6 placemat of pictures or key words (or both). Students roll a die to select the row and the column, ultimately collecting two pictures. They then have to explain the link between them in the context of the topic at hand. Surprisingly engaging and more-ish. What If? – What if the Internet broke tomorrow? Students consider the question and suggest 3 things. Now ask which is th emost likely, the most appealing, the most concerning? Bloom’s Taxonomy Planner – There are a few versions of this around. Print one out and stick it near your desk or wherever you plan. You could devise questions for your lesson plan or make them up on the hoof, but by having the starting points at your fingertips you can tailor the level of challenge to the progress of the students. Struggling? Ask some basic knowledge questions. Doing well? What about some application or analysis? High fliers? Jump straight to synthesis and evaluation. Thinking Dice (URL)- This wasn’t actually included in the session but following a brilliant session by Steve Bunce at the Optimus Education ICT2012 conference last week the whole department are getting some thinking dice. 6 brightly coloured dice with question starters ranked by their level according to Bloom. Get the students to come up with the questions for you. Weaker students can start with the red – the most able with the blue and purple. At £10 a throw (no finaincial gain for me, I promise) I think they look pretty good. Matching Words – Start with an unrelated topic (e.g. cars). Individuals (in teams of 4) have 60 seconds to write down as many words as possible. The team captain then reads out their list and ONLY gets a point if EVERYONE in the group has that word. Repeat for a related topic and add the scores. In theory, all teams should do better on the second attempt, and they are surprisingly reluctant to cheat. So there you have it. 34 ideas by my reckoning. That’s even more than you get at an average teachmeet, for an entire staff and at a total cost of £0. Easily the best value CPD I’ve had this week. Like the idea of what the Image is starter – makes learning objectives come alive!